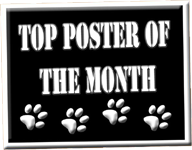 Congratulations to our Top Poster for February! Congrats!! Hannah owns this award! Wow Hannah, way to go!!!! Jabber jaws! Haha I'm kidding! It's great to see you are always an active part of the forum! Apparently we all need to talk more since you're always winning!